Newell Cyrus Langley was born in 1827 in Hinesburg, VT to William and Almira Clark Langley. William was born in Rutland, and Almira in Hinesburg. Almira's father had been enslaved in New Milford, CT when he was young. Newell married Harriet E. Butler, b. 1835, and eventually mustered into the MA 54th with his brothers, Lewis and Loudon (both buried at the National Cemetery in Beaufort, SC). Newell did not return home with his unit because he was suffering from disease in an army hospital at Hilton Head, as was his brother Lewis. Lewis died of disease, but Newell eventually recovered and returned home in 1865. He and his father bought 9 1/4 acres of farmland in Williston on Nov. 11, 1865. (Land Records of Williston, vol. 13, p. 11.) By the 1870 census, the value of their real estate was $1000. Harriet was keeping house, and they had four children: William 13 in school; Mary 11 in school; Cora 7 in school; Blanch 5. Also living with them were his father William and his brother Henry. By 1880, of their 4 children only their son William has survived. On Jan 25, 1892, Newell died of heart disease at age 65. His gravestone in Morse Cemetery has his name with birth & death dates. 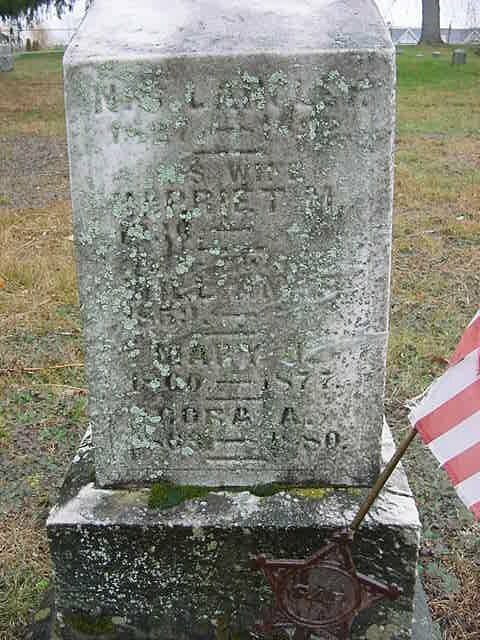 Harriet's name is there with only her birth date because she died in St. Armand, NY while living with her son and his wife, Addie/Ada Hazzard. They had a son, Paul, in 1903. Harriet died Sept 22, 1909.